Moscow is calling for an impartial international investigation into alleged use of chemical weapons in Syria, where civilians are reported to have been killed. On March 19, the Syrian authorities reported that chemical weapons has been used in the province of Aleppo by the armed opposition. 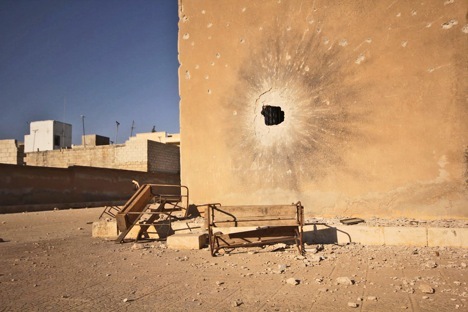 The Syrian Foreign Ministry said in a statement that the militants fired a rocket carrying chemical agents at the town of Khan al-Asal: “The rocket fell into a heavily populated area and exploded, releasing a smoke cloud that caused civilians to choke”. According to official reports, the rocket killed 25 and injured more than 100 others. Russian politicians and experts are treating the incident as a provocation by the opposition and an attempt to justify military intervention by western powers. “We expect the UN Secretary-General to respond to Syria’s request for a probe into use of chemical weapons on 19 March ASAP. It is important to bring together an impartial and professional team of experts to draw objective conclusions,” Deputy Foreign Minister of Russia Gennady Gatilov tweeted. Previously, Russian Ambassador to the UN Vitali Churkin made a similar statement. According to him, Moscow expects an impartial, objective and thorough investigation into the incident. The opposition, for its part, is blaming the authorities and says that the Syrian military shot a Scud missile carrying combat chemical agents. Officially, Damascus has denied all the accusations and said that it had no plans to use chemical weapons against terrorists but would do so against foreign aggressors. Russian politicians and experts have been even more resolute when commenting on the reports coming from Syria. Aleksei Pushkov, Chairman of the State Duma’s International Affairs Committee, said in his microblog that use of chemical weapons was a provocative act by the opposition and the external powers that support it. “Why should the Syrian government use a single rocket with chemical agents in its current position? What’s the point? This is a provocation engineered by the opposition and those who provide it with arms,” Pushkov said. Aleksandr Ignatenko, head of the Institute for Religion and Politics, shares this opinion. “I don’t think the Syrian administration is interested in using chemical weapons. President Assad is very well aware that it would give the green light to the US with its plans to create a no-fly zone over Syria and supply heavy weapons to the opposition”, he told Gazeta.Ru. Interestingly, the recent report about use of chemical weapons is not the first of its kind. In late December 2012, Al Jazeera television reported, with reference to a source in the opposition, that Syrian aircraft had dropped bombs carrying poisonous substances on al-Bayada in the vicinity of Homs. Videos shot by opposition activists appeared on the Internet. Yet the information was never officially confirmed. Russian Foreign Minister Sergei Lavrov said then that use of chemical weapons would “be political suicide for the Syrian government”, so the Foreign Ministry was double checking reports of any incidents of this kind. Obama added that the world community would have to take action if that information was confirmed. So far, Washington does not appear enthusiastic about direct intervention in the conflict and is hoping for international political and diplomatic efforts. Nevertheless, on March 19, Navy Admiral James Stavridis, who serves as NATO’s supreme allied commander for Europe, told the Senate Armed Services Committee that the situation in Syria was deteriorating by the day and that the alliance was getting ready for an armed intervention, which would repeat the Libyan scenario. He added that the operation would require a resolution of the UN Security Council, consensus of the 28 NATO Member-States and agreement by the countries in the region. The reports of use of chemical weapons in Syria appeared amid attempts to resolve the crisis on the basis of the Geneva Communiqué. The opposition is demanding military assistance from the West and making use of various pretexts to avoid direct negotiations with Assad. In the meantime, some European nations are getting ready to supply heavy weapons to Syria, including antiaircraft and antitank missiles. Based on reports by RIA Novosti, Gazeta.RU, Nezavisimaya Gazeta, Al Jazeera, The New York Times and press service of the U.S. Department of Defence.